Notepad Replacement, Replace Notepad,Text Editor, DIZ Viewer, NFO Viewer, file_id.diz.ASCII Art, DIZ, NFO, Nuse, stability, and small size. The user interface is handy, specific, and configurable. GetDiz is a Notepad replacement that offers a wide range of features while maintaining incredible speed, ease of use, stability, and small size. The user interface is handy, small, specific, and configurable. Do you want to go through a bunch of text files quickly in Explorer? Turn on the 'Allow only one GetDiz instance' option and click on every file. 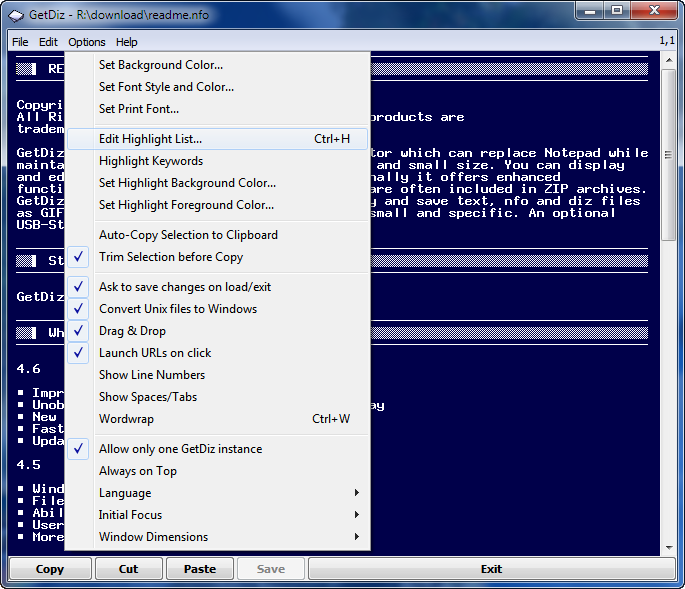 GetDiz will display the files one after another in the same window. You can even configure different fonts for different text file types, for example one font for .txt, and another one for .nfo files. This is only a fraction of many features unique to GetDiz.